In a country far, far away there lived a poor widow and her son - Aladdin. One evening a stranger knocked on the front door. “Good evening,” he said, “My name is Mustafa and I am looking for my brother’s son - Aladdin. I have been away for a long time but now I am back and as his uncle I would like to take Aladdin to work for me, so that he can help you by earning honest money.” Aladdin wasn’t too keen on the idea, because there was something about Mustafa that he didn’t like.But his mother couldn’t have been happier at the news and she agreed to let Aladdin go with his uncle. The next day Aladdin packed a small bag of food and left with his uncle. The two walked for a day into the desert until they reached a cave. 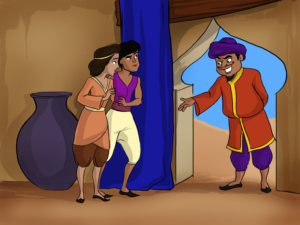 The entrance was too small for Mustafa to get in, so he told Aladdin to go inside for him. 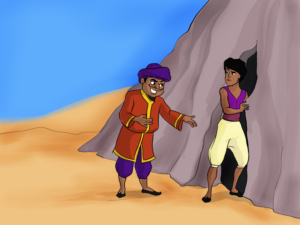 Aladdin, who suspected that Mustafa wasn’t very truthful, didn’t want to risk his life for a stranger at first, but his uncle told him that there were gems and gold inside the cave. “You can take as much as you want. I only want you to find an old lamp for me and I will pull you out of the cave,” Mustafa said. 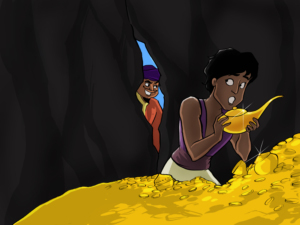 When Aladdin climbed into the cave, he couldn’t believe his eyes! 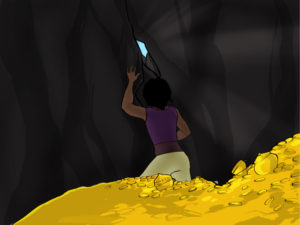 The cave was full of treasure, just as his uncle had said, so he started filling his pockets with as many diamonds and rubies as possible. He also found a gold ring which he immediately put on his finger. Finally, he found the lamp Mustafa had asked for. He asked his uncle to give him a hand getting out of the cave, but Mustafa told him that he wanted to see the lamp first. 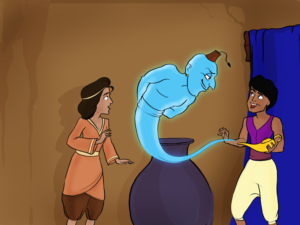 Aladdin, who was suspicious of his uncle, thought that Mustafa would take the lamp and leave him, so the boy refused to give him the lamp. Mustafa got angry, “Listen, boy, I am not your real uncle and I don’t care about you. I will leave you here if I want! 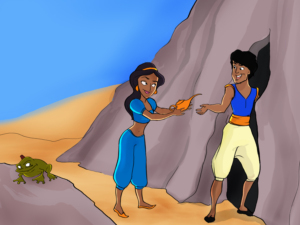 Since you don’t want to give me the lamp I will block the cave with this huge rock,” he shouted, and left Aladdin inside. And just the next moment he was sitting at home, right before his mother, who almost fainted at the appearance of her son out of the blue. 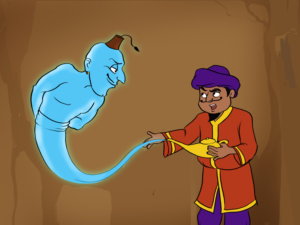 Aladdin told her all about Mustafa, the cave and the treasure.While talking about the treasure, Aladdin rubbed his ring and a second genie appeared! 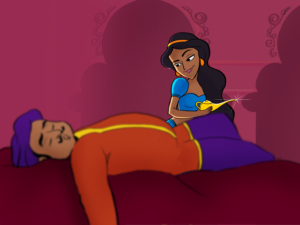 This time Aladdin’s mother fainted! “Master, I can grant you two wishes! Choose carefully,” advised the genie and waited. “That’s easy - give us enough gold and gemstones, so that we can be rich until the end of our lives and even longer,” said Aladdin. 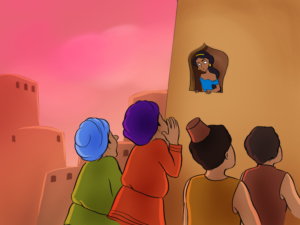 One day as he was walking around the city with his friends, Aladdin saw an exceptionally beautiful girl. He immediately fell in love with her. She was the sultan’s daughter - the young princess Yasmin. She was the gentlest, most adorable and the very prettiest girl that he had ever met. 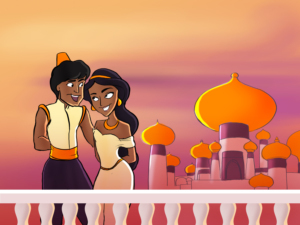 Princess Yasmin liked him too and a few days later Aladdin went to the palace where the sultan lived. 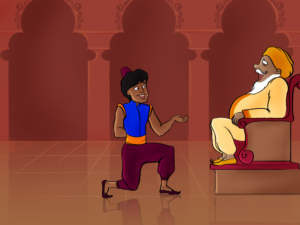 “I want to marry your daughter,” Aladdin said to the sultan, as if he were a sultan too! Instead of getting angry, the sultan laughed. “You will have to have a palace at least like mine to ask for my daughter’s hand,” he said. “You will have that palace by tomorrow,” Aladdin replied and the same night, when he was alone, he asked the genie from the lamp to grant him his second wish - to have a palace as big as the sultan’s and right next to it. The palace was there the next morning. 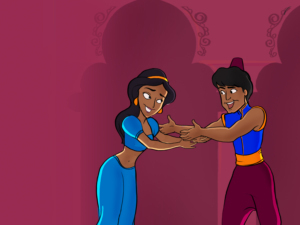 The sultan let his daughter marry Aladdin. After the sultan’s death, Aladdin ruled the country and everyone lived happily. This news reached Mustafa, who knew how Aladdin had become so rich and powerful. He thought of a plan to get the lamp. He waited for Aladdin to leave the palace and stood under Yasmin’s window, shouting as loud as he could. “New lamps for old lamps! Only today in the city! New lamps for old lamps!” and people started crowding around him. Soon he noticed the princess among them. 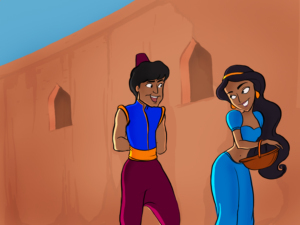 She thought she could exchange the old ugly lamp, which Aladdin liked so much and kept in their bedroom. 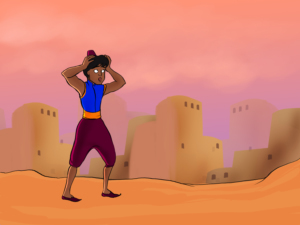 When Aladdin came back in the evening he found to his surprise that Yasmin and the whole palace were missing. He searched for them for three days and three nights and when he couldn’t find them on his own, Aladdin rubbed the ring and asked the genie from the ring to grant him his second wish - to get him to Yasmin. As soon as he had wished for it, he found himself in Yasmin’s room. “My dearest Aladdin, I knew you would find me!” They hugged and thought through how to trick Mustafa, so that he couldn’t do any more harm. 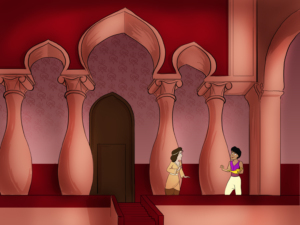 Aladdin hid in the palace and Yasmin went to find the vicious man. “I don’t think that my husband will ever find me, so I would like to become your wife,” she told him. Mustafa believed her. He decided that this was the best day of his life and he got so drunk that he fell asleep. 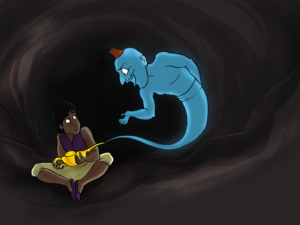 Yasmin quickly took the lamp and ran to find Aladdin. They rubbed the lamp and asked the genie to take the palace back to its old place. Soon they were in their city and everything seemed to be back to normal but with one little exception - Mustafa. Aladdin asked the genie from the lamp to grant his last wish and to turn Mustafa into a frog so that he could never bother them again. When they had no more wishes left, they returned the lamp and the ring to the cave and lived happily ever after.